Walking through Hampton Court gardens just outside of London, England last week was, for me, like literally stepping into the pages of one of my favorite nightstand books, Royal Gardens of Europe by George Plumptre. Before falling asleep at night, I love leafing through the beautiful pictures of perfectly clipped yews, pruned trees, graceful statuary and large swaths of colorful plants. It fuels my dreams about having such a view in my own backyard. Ah, but I don't live in a palace. So the unplanned and unexpected opportunity to go visit one of the historical gardens featured in this book was exciting. The royal castle itself is fascinating, being a house architecturally divided between a Tudor castle on the right for Henry VIII and a baroque fantasy home on the left for William III and Mary. The Tudor castle dates back to the 1500's. 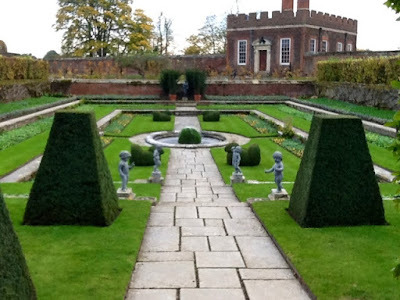 The 60 acres surrounding the castle are palatial, of course, and there are several different gardens to enjoy, including a walled rose garden, parkland currently with trees glowing in autumn color, a maze made of one thousand yews and a medieval herb garden near the large kitchen compound of Henry VIII. 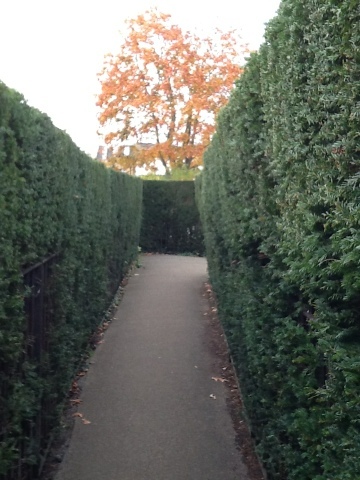 Kids love this maze. I went through it and, honestly, I was just a tad anxious after a while to find my way out. Nearby, the autumn glow from a grove of trees was brilliant, as the English would say, especially for a California resident who rarely gets to enjoy autumn weather and crunch fallen leaves by walking on them. The castle sits next to the River Thames and on the short walk from the train station this is the first impression from the bridge. 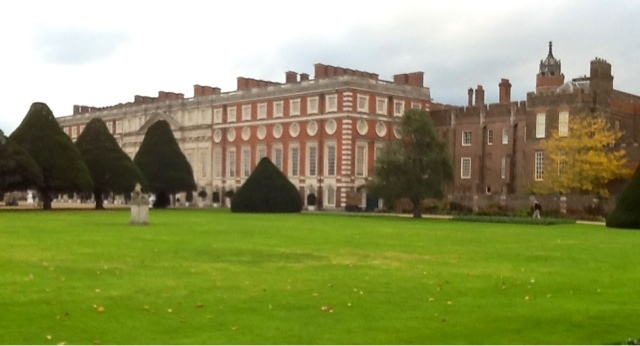 But I confess, I am really here for one thing: formal royal palace gardens. 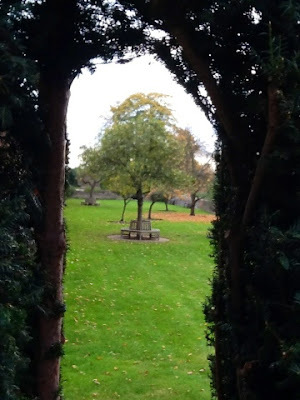 And after 12 hours of flight, a five hour layover, public transit and a train to the outskirts of London, I am--finally--walking the perimeter of the castle and its grounds and I found it. 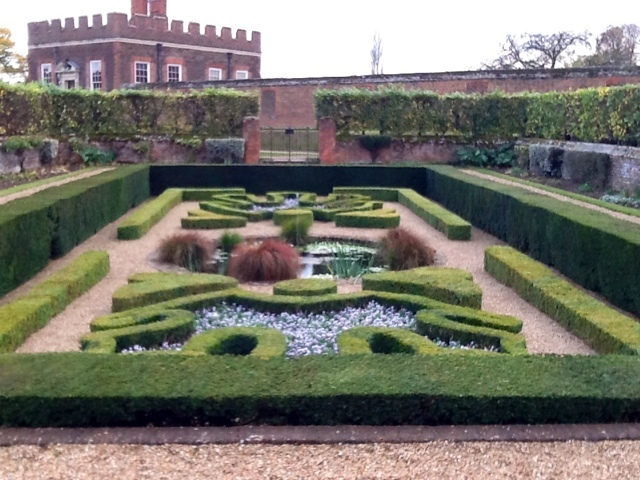 and envy the knot gardens. And, though it is not spring or summer when the garden would be filled with colorful bulbs and annual flowers, this garden is still beautiful in its bare-boned structure and design. 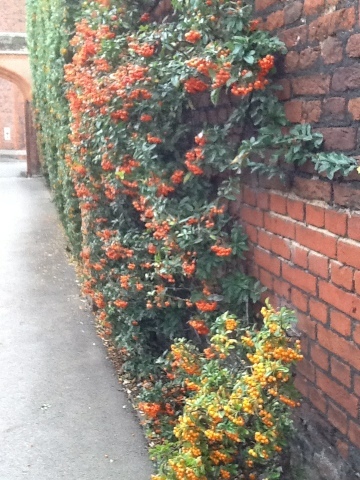 Autumn offers not only the changing colors of the trees but berries that are blooming like crazy on the pyracantha, holly and even the yew in the fountain garden. 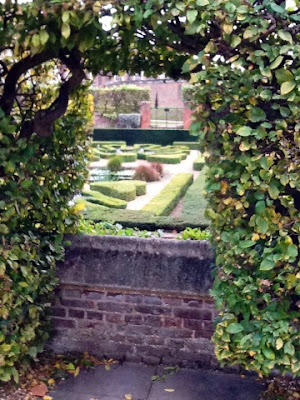 One of my favorite and unexpected features are the cut out windows in the hedges that offer just a glimpse of the view in the garden beyond. This gateway below serves as the entrance and exit to and from the formal garden on the baroque side of the castle. I was exhausted by the time I walked through here but exhilarated when I left. Garden hopping in the autumn in London? Are you sure? Absolutely. Quite right. Now that I am back home I am, again, thumbing through this gorgeous book, Royal Gardens of Europe. I'm thinking I just might set my future sights on some dream gardens in Italy. Now I know--it could happen.